I had the great pleasure of being up in the Olympic Peninsula for the Elwha Dam removal ceremonies a few weeks ago. With the Native American tribes singing songs to welcome the salmon back, and innumerable dignitaries pontificating and bloviating, it was a great celebration that culminated when an excavator punched the first hole in the Elwha Dam. But what, if anything, can we here in California learn from this effort in Washington? As background, the Elwha River flows from the Olympic National Park into the Straits of Juan de Fuca, just west of Port Angeles. 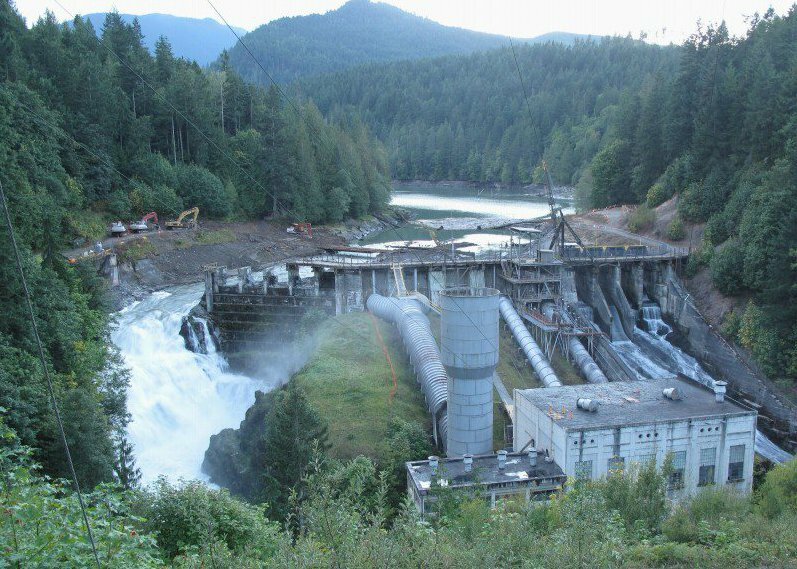 In 1913 the Elwha Dam was completed. In 1927 the Glines Canyon Dam was constructed upstream. 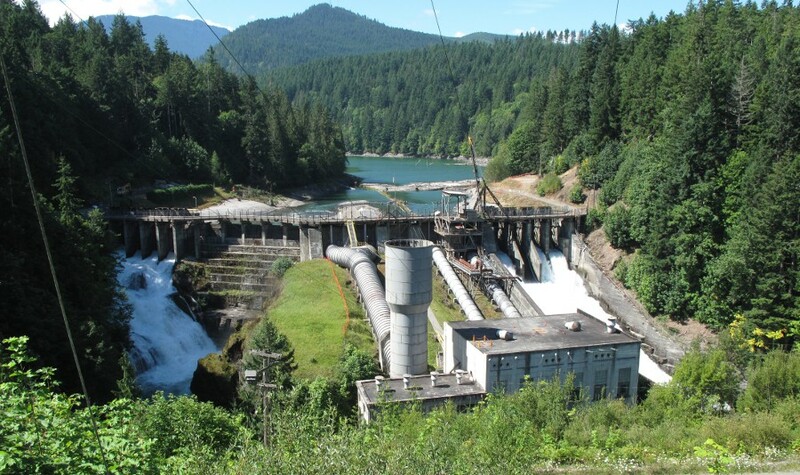 These two dams were built to provide electricity used in a paper mill in nearby Port Angeles. 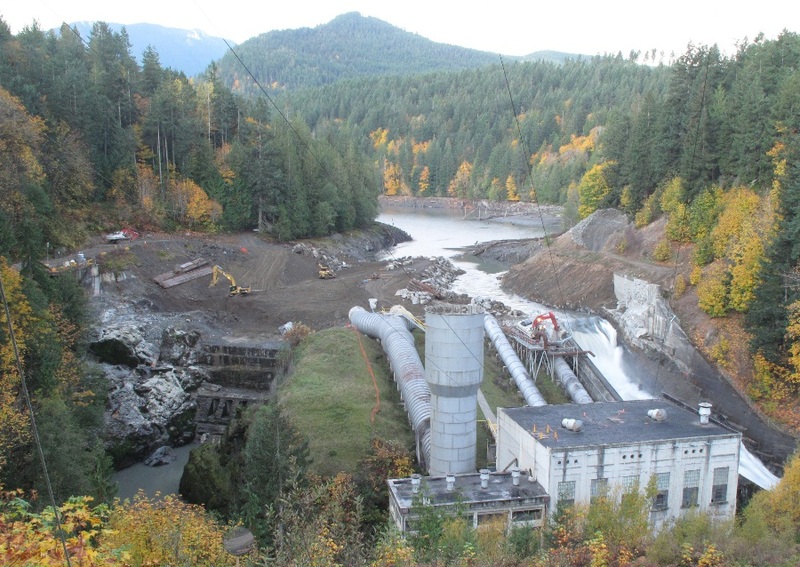 The dams blocked 90% of the watershed’s spawning habitat for steelhead and salmon. Prior to closure of these dams, the Elwha Chinook salmon runs supported large commercial and tribal fisheries, with estimated spawning runs of 400,000 fish. The river was famous for its huge fish, with some Chinook exceeding 100 lbs. The dams knocked the salmon and steelhead runs back to a few thousand fish. Other than harvest practices, there are no “multiple stressor” complexities in the Elwha. 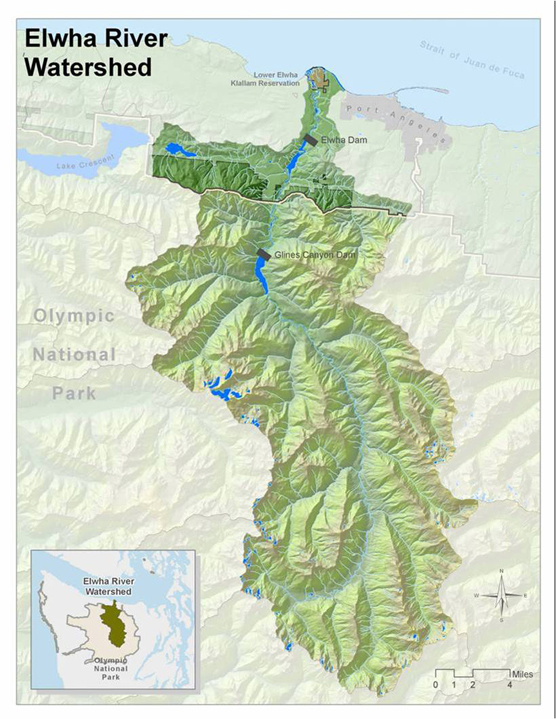 The watershed is mostly wilderness, lying principally within Olympic National Park. Dam removal and river restoration should have been easy. The little electricity generated will be replaced by a cheaper alternative. The removal costs are modest, and the risks from sediment released are manageable. Restoration is likely to occur quickly, with significant improvements in salmon populations and fisheries that exceed the value of the electricity. What was so striking about this effort was the broad level of support. The last four US Presidents and their many agencies have backed this project (although the Gingrich Congress and Senator Slade Gorton held it hostage in the 1990’s). Washington’s governors, senators and congressmen supported the project. The tribes, an array of conservation groups, the Park, Port Angeles, and the dam owners were all on board a long time ago. Yet with all that support and those benefits it still took 25 years of hard work to begin the physical process of dam removal. The lessons for California water management are twofold. First, even straightforward projects take a great deal of time; complex projects can take decades or longer. Yet whether it is the efforts to remove dams on the Klamath or build a “punnel” (peripheral tunnel) under the Delta, the proponents consistently hype the optimistic timetable. Plans, permits, politics and people all militate against, and usually overwhelm, the rosy scenario. The second lesson relates to the politics of inclusion and hanging in there. On the Elwha, the key players came to the table, negotiated a solution, and stubbornly, doggedly stayed involved over the many years. The less helpful were simply left out of the process. This obstinate will to persist, particularly by conservation organizations and tribes, made this project happen. Notably, in comparison to California, the lawyers/acre ratio was relatively low, which was probably helpful. Watch how fast the dams come down and how they manage sediment in the river. And think about how long it took, and what heroic efforts were put forward by individuals, organizations, agencies and even some politicians. And for certain, next time you hear “we’ll have the project done in five years”, laugh, then double, triple or quadruple the number. Graf, W.L., 2005. Geomorphology and American dams: the scientific, social, and economic context. Geomorphology 71, 3–26. Konrad, C.P., 2009. Simulating the recovery of suspended sediment transport and river-bed stability in response to dam removal on the Elwha River, Washington. Ecological Engineering 35, p. 1104-1115. Olympic National Park, 1996. Final Elwha River Ecosystem Restoration Implementation Environmental Impact Statement. U.S. Department of the Interior, National Park Service, Port Angeles,WA. Pess, G.R., L. McHenry, T.J. Beechie, and J. Davies, 2008. 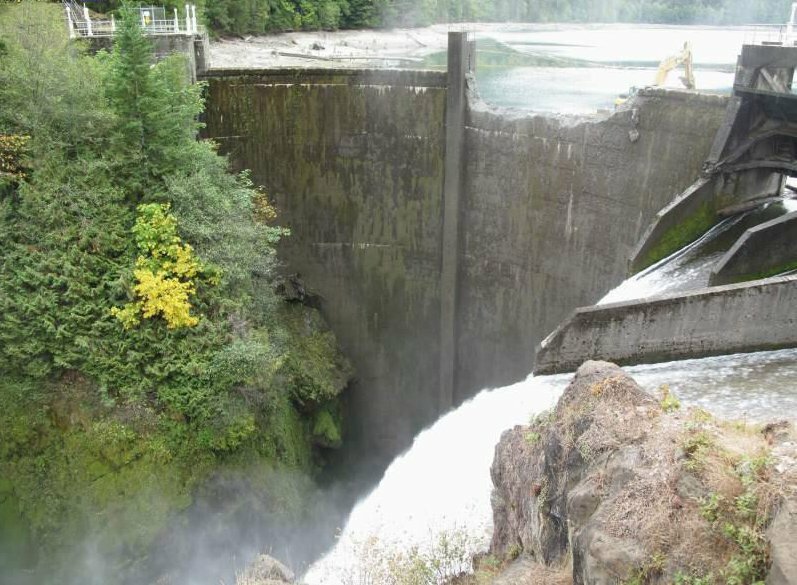 Biological impacts of the Elwha River dams and potential salmonid responses to dam removal. Northwest Science 82, p. 72-90. Randle, T.J., 2003. Dam removal and sediment management. In: Graf, W.L. (Ed. ), Dam Removal Research; Status and Prospects. H. John Heinz III Center, Washington, D.C, pp. 81–104. This entry was posted in Dam Removal, Restoration and tagged dam removal, Elwha Dam, Elwha River, flow restoration, salmon, UC Davis Center for Watershed Sciences. Bookmark the permalink. Pingback: How Hard Is Dam Removal? | California Trout, Inc.